The hummingbird moth sips nectar with a long proboscis. The return of chilly weather and disappearance of leaves from our deciduous trees has put a bit of a crimp on bug activity outdoors over the last week or two. This slack time provides a chance to catch up on the “Bug of the Week” guest book and view some of the interesting images sent by readers. A hummingbird moth warms in the morning sun on an old log. Earlier this summer Kevin observed what appeared to be a small hummingbird zipping around his flowers. It looked like a hummingbird, but not exactly. This curious animal was actually a moth and a relative the tomato hornworm that we met in a previous episode of Bug of the Week “Horning in on your tomatoes, September 26, 2005. Hummingbird moths are beautiful insects as both adults and larvae. The adult flies very rapidly to a blossom, inserts a long straw-like proboscis into to the flower, withdraws nectar in just a few seconds, and flies to the next feeding station. Some of its favorite flowers are honeysuckle, snowberry, lilac, phlox, bee balm, trumpet vine, vetch, butterfly bush, and thistles. In addition to feeding like a hummingbird, some say that the greenish hairs on the back of the moth resemble the feathers of a ruby throated hummingbird. The flight and feeding behaviors in conjunction with the unusual coloration might be enough to confuse a hungry predator. While a tasty moth might make a fine meal, a predator might think twice about eating a hummingbird. Hummingbird moths are found throughout the United States and venture as far north as Alaska. 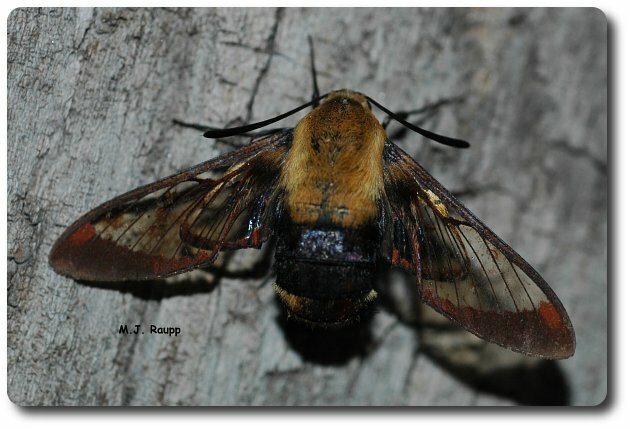 Hemaris thysbe has two generations in southern states and one in the northern part of its range. Honeysuckle is one of the plants consumed be caterpillars of hummingbird moths. After feeding and mating, females lay eggs on the leaves of small shrubs and vines. Honeysuckles, snowberries, viburnums, hawthorns, and cherries are among its favorites. 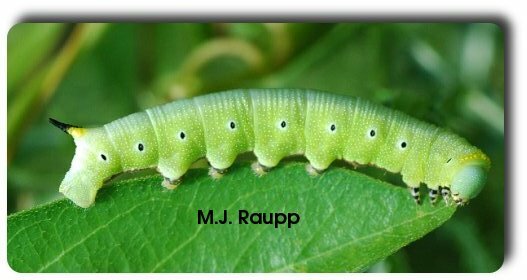 From the eggs hatch caterpillars that munch leaves. Like many species of hawk and sphinx moths, the caterpillars of hummingbird moths have a rather dramatic horn on the upper surface of their rear end and are commonly called hornworms. After consuming leaves for several weeks, the caterpillars disperse from their food source and move to the ground to form rather nondescript pupae. While hummingbirds and their insect look-alikes are gone from our gardens this year, planting annuals and perennials with tubular flowers in the spring will ensure a return of these marvelous insects next year. 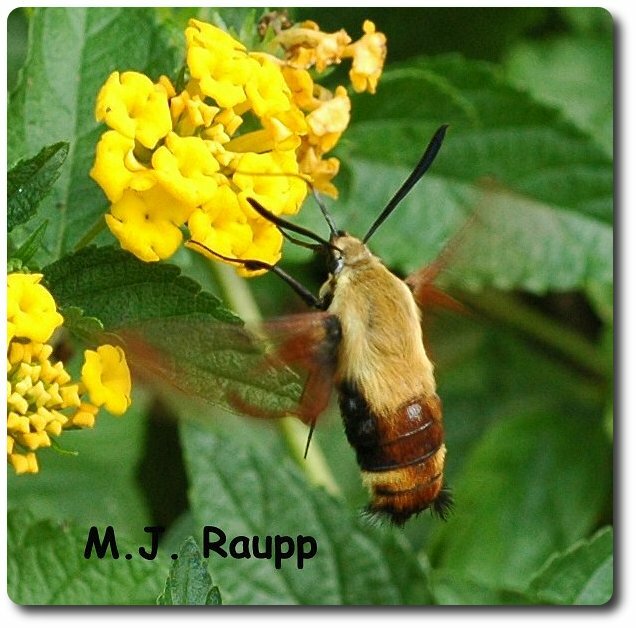 To learn more about hummingbird moths, please visit the following web sites.